The story of Sati Shree Lirbai Maa has been passed on from generation to generation for over two hundrend years. The story begins with Jeevan Modhwadia. He was from the Modhwada Gaam. Jeevan was well-known in Modhwada, however, people knew him for all the wrong reasons. People used to try and avoid him, and try not to catch his eye; if they did they used to shake with fear. The Patel approached Jeevan, where he was doing his prayers and noticed that the bulls Jeevan had, were similar to his. He went to Sant Devidas and told the Sant that the bulls looked alike to his, but they were a different colour. The Patel later left and Jeevan started to cry. He couldn’t believe it! He approached Sant Devidas, as he has just finished his prayers and held his feet. In this space of time, Jeevan Modhwadia realised that Bhakti was the path that he wanted to take. From that day on, Jeevan Modhwadia was known as Jeevan Bhagat. He stayed at the holy place of Parab for twelve years. He did a lot of ‘seva’ and Bhakti. Then one day, Sant Devidas sat Jeevan Bhagat down and told him that he felt it was time for Jeevan Bhagat to go. He felt that Jeevan Bhagat had a calling to go. 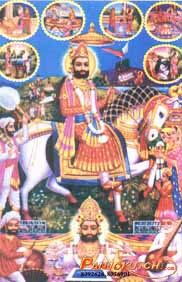 Jeevan Bhagat bowed to Sant Devidas and started to walk. He stopped at the Gaam of Vekadi. There, an Ahir family had a function. Jeevan stayed all night and sang Bhajans and Kirtans. The next morning, the Ahir’s daughter, Sonal, decided that she wanted to go with Jeevan Bhagat to Modhwada to do Bhakti. Son Bai’s parents weren’t sure. They didn’t want their daughter to go with an older man, by herself because people would talk. It wasn’t reputable for a girl to go with a single man by herself. Son Bai didn’t say anything and she went to the nearby well to fill some water. She came back and her fingers had divas on them, her tongue was all the way around her neck and the water carrier (Bedu) was three to four inches above her head. This was a parcho and Son Bai’s parents realised that she wasn’t an ordinary woman-but a Maha Sati. They let her go and Jeevan Bhagat and Son Bai walked and walked until they got to Modhwada. As Jeevan Bhagat had come back to Modhwada after so many years, not many people recognised him. People started to talk. They gossiped saying that they couldn’t understand why Son Bai’s parents had let her go with a man by herself. They tried to look at Son Bai and their eyes started to hurt. There was some much glow and radiance on Son Bai’s face that they just couldn’t even glance at her. People realised that this woman wasn’t an ordinary woman. They also found that the man was Jeevan Bhagat, and everyone was surprised at how much he changed. In Modhwada Padaar, near the ‘Bava Vaav’ they found a little hut and that is where both of them lived. As people recognised Son Bai’s ‘Shakti Roop’, they often came to their hut where they sang Bhajan and Kirtans and had Prasad. Regularly, there came a seven year old girl. She used to go to the hut, to get water. There, she used to stay on and sing Bhajans, sweep the floor and help Son Bai and Jeevan Bhagat. She was the daughter of Lakhi and Luno Modhwadia- her name was Liri. Lir Bai enjoyed going to Jeevan Bhagat’s hut where she sang Bhajans until late in the night. Both Son Bai and Jeevan Bhagat were fond of her, and she was like a daughter to both of them. They were fond of her because she was interested in God at such a young age. A few years later, when Lir Bai Maa grew older, Jetha Bhai Keshwala, from the nearby village of Keshav came and asked Luno Bhagat, if he wanted to give her daughter to their family. Luno Bhagat pondered and decided to ask only two people- Jeevan Bhagat and Son Bai. The next day, Luno Bhagat went and asked them. Son Bai replied saying that all girls should eventually get married, and it was now her time. They told Luno Bhagat that they should take Ramapir’s name and start preparing. A year later, Lir Bai Maa got married to Vajshi Jetha Keshwala, from Keshav. As Lir Bai passed Son Bai’s hut, she bowed to her Guru’s and put her head on Son Bai’s lap and started crying. Son Bai reminded Lir Bai of her duties, now that she was a wife. She reminded her that she should always keep her parents respect and reputation in mind. Being quite young and newly married, Vajshi Keshwala had a bad temper and got irritated regularly. He would often go out socialising, come home late and argue with Lir Bai Maa for no reason. Remembering what Son Bai had told her, Lir Bai put up with it as much as she could however, one day, she couldn’t bare it anymore. Getting her belongings, Lir Bai Maa went back to Modhwada, where she stayed at her parent’s house. Frequently visiting her Guru’s, she would sit there for hours singing Bhajan and Kirtans. Two months passed, and Lir Bai Maa still hadn’t come back. Vajshi Keshwala’s friends started to mock him saying that he couldn’t stand up to Jeevan Bhagat or Luno Bhagat. They told him that it was Son Bai and Jeevan Bhagat’s fault that Lir Bai had left. They told him that he should go immediately to Modhwada and confront everyone. Modhwada; he found out that Lir Bai Maa was at Jeevan Bhagat’s Hut and that made him angrier. Vajshi Keshwala listened in to the conversation that Son Bai and Lir Bai were having. Son Bai Maa told Liri Maa that a husband is like God and that she should go and return to Keshav as soon as possible. She explains to Lir Bai Maa that she shouldn’t be staying at her parent’s house when she is married. Vajshi overheard and realised that they weren’t trying to destroy their marriage, but to make it better. He walked in and started crying. Bowing down to Jeevan Bhagat and Son Bai, he apologises and asks for forgiveness. Accepting his apology, Jeevan Bhagat tells Lir Bai and Vajshi Keshwala to go back to Keshav and do a Barporo Paath (Ramapir’s Paath) at Bij (2nd day of the month). 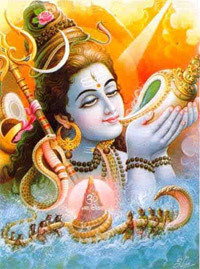 Returning to Keshav, he was now known as Vajshi Bhagat. Lir Bai Maa went on to have two boys, Punjo and Patho and a daughter called Puti. As a family, they would often sit and sing Bhajans, whenever people came to their house; they would make prasadi and made sure that everyone ate before they left. On Maha Bij, Vikram Savant 1854, Jeevan Bhagat and Son Bai took their Samadhi in the Gaam of Modhwada. Invitations were sent out to Virpur, Satadhar and Parab. Lir Bai Maa and Vajshi Bhagat found it hard as did many of the people in Modhwada. One day, Jeevan Bhagat became ill. Even though the people from Keshav advised him to take some medicine, Vajshi Bhagat disagreed. He felt that his time had come for him to take Samadhi. Liri Maa did not agree with this. She explained to Vajshi Bhagat that it was not right for him to go before her, as she is the wife, she should take Samadhi her first. Lir Bai Maa tells Bhagat that many women have died for their husbands and for Vajshi Bhagat to go first-it wouldn’t be right. The only way forward was for someone to give their life to him. Contemplating this, the next morning, Puti Bai got some Tulsi leaves; water and incense gave it to Vajshi Bhagat and told him that she would give her life to him. She explained that Punjo and Patho were sons and that they would carry on the family name. Sati Puti Bai was ten years old when she gave her life to her dad. 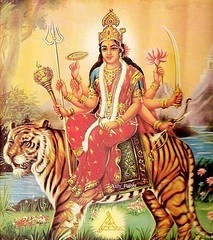 Her mandir and Samadhi is in Keshav. She is known as ‘Puti Sati Aai’. Punjo and Patho got married to two sisters from the Gaam of Tukda. Now that their sons were grown-up and married, Lir Bai and Vajshi Bhagat gave all the responsibilities to them. 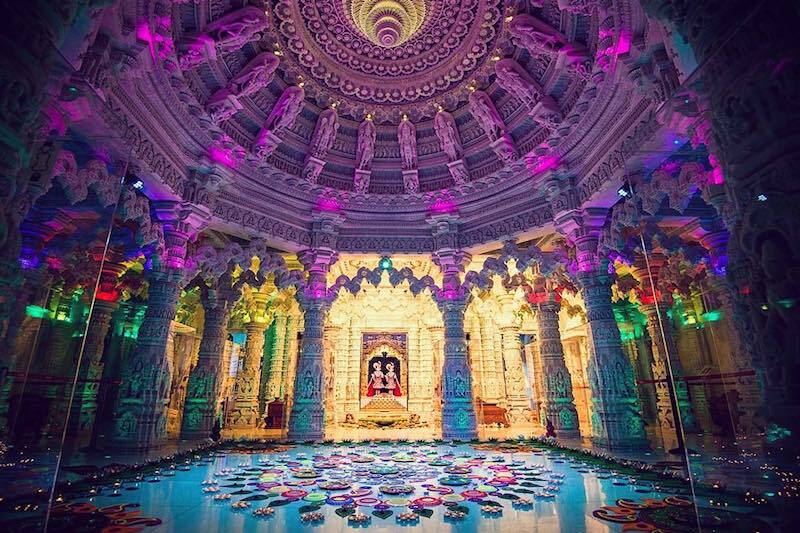 Wanting to take her Samadhi at Modhwada near her Guru’s, Lir Bai went and asked Vangha Patel if that was possible. Knowing that Lir Bai was a Devi, he carefully explained to Lir Bai, that he or the rest of the people in Modhwada couldn’t bear to see their daughter being buried in her home Gaam. Without uttering a word, Lir Bai Maa returned to Keshav, where she felt that she wanted to leave Keshav and go to the village of Kandora. The people of Keshav were upset and they kept questioning the reason why Lir Bai Maa wanted to leave. Sati explained that she felt like Kandora was calling her and that it was in her destiny to go. Settling in Kandora, Liri Maa held a Barporo Paath, where Nathoo Bhagat from Kotri came; Natha Bhagat from Ratadi, Rajshi Bhagat from Nagka and Rudi Aai from Modhwada. Every Bij, Lir Bai Maa and Vajshi Bhagat held a Barporo Paath. They would sing Bhajans have prasadi. The time came when Lir Bai Maa wanted to take her Samadhi. Her time had come and she knew that she had to go. Calling Natha Bhagat, Nathoo Bhagat, Rajshi Bhagat and Rudi Aai, as well as many others, Lir Bai Maa held her last Barporo Paath. 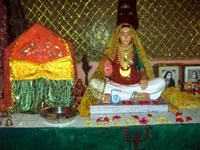 Sati Shree Lir Bai Maa took her Samadhi on Maha Bij, Vikram Savant 1832. Vajshi Bhagat took his Samadhi a year later. There are many mandirs of Lir Bai Maa, which are in Modhwada, Keshav, Kotdi, Rana Kandorana, Sisli and Kinderkheda- to name a few. Not only was Lir Bai Maa a Maherani, but she was a Maha Sati that uplifted the Maher name and made the Maher Naat proud.